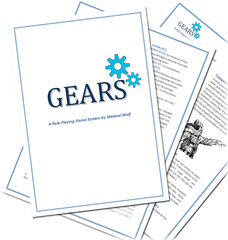 Recently my friend Andrew Modro informed me that there’s already someone working on a roleplaying game called Gears (http://www.gears-rpg.com). So in order to avoid confusion and possibly some trouble I decided to rename my upcoming multi-genre roleplaying game system. In my humble opinion the name Gearbox still carries that idea and even makes it sound a bit like a toolbox. So in a way, Gearbox may even be a better name. In the coming days and weeks I will remove all the mentions of Gears and the logos etc. from the site and will replace them with updated versions. The game itself is still in an early phase of development but I hope I will be done before next Gen Con. This morning I decided I should make the latest version of Gears available to the public. The 17-paged PDF I uploaded to the site today contains enough rules to do some playtesting off the various aspects of the game. A few things are still missing, like talents and powers. But aside from that it should be fully playable. If you have any ideas how to improve the game, please post your thoughts in the Gears forum.